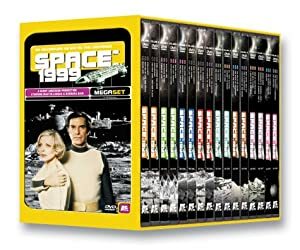 Space 1999 was a 1975-1977 science-fiction TV show. It was thus just pre-Star Wars – an important landmark in terms of genre credibility. It was British, though it headlined US actors for the American market. Said actors were from the then-hot Mission Impossible series, and the showrunners were the Andersons, who made most sci-fi shows in the UK that weren’t Doctor Who (for instance, Thunderbirds). Despite that the series didn’t fare well – but there still exists significant nostalgia about it. Real Name: Dr. Helena Susan Russell. Known Relatives: Lee Russell (Husband, deceased), Unnamed father (deceased). Base Of Operations: Moonbase Alpha, crater Plato, Luna. Height: 5’7” Weight: 120lbs Age: Early to mid 40’s. 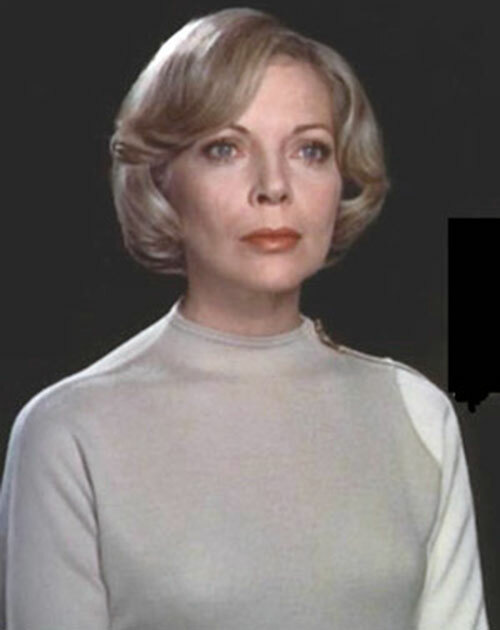 Note: I’m even worse at judging female Heights and Weights than those of males so send a post if my Barbara Bain doesn’t seem accurate. Like most of Moonbase Alpha’s personnel, Dr. Helena Russell is an expert in her chosen field. She is a brilliant medical doctor and scientist and a leading authority on the physiological and psychological effects that long-term space missions have on human subjects. Though rarely required to employ sidearms in her capacity as the base’s Chief Medical Officer, she is, nonetheless, acquainted with the workings of the standard issue Stun Gun Models 1 and 2 and has fired them on occasion. As evidenced by the incredibly accurate representation of Maya that she created for the space trader, Taybor, she is a gifted amateur sculptor. What follows can be verified by official sources. Helena Susan Gordon (Note: Most unofficial sources list Helena’s maiden name as Gordon. I have been unable to verify this fact using official sources but the DCU implications are too perfect to omit this unverified fact) was born in Chicago, Illinois on August 5, 1960. A physician’s daughter, Helena entered medical school shortly after her father’s death. Upon completion of her studies she began research in her chosen field of space medicine and her ground breaking work in this field won her many awards. Dr. Russell, Professor Victor Bergman, and Commander John Robert Koenig have known each other at least since 1996 when all three were involved in the Ultra Probe mission, an attempt to explore the mysterious planet Ultra discovered by Bergman in 1994. From all indications, these three principal Alphans have known each other even longer. This research also brought Helena to the attention of the World Space Commission. While working for the Commission she met Astronaut Lee Russell. The two fell in love and were married. Their happiness was not meant to be, however, as Lee disappeared along with his ship, the Astro 7, while on the first manned mission to Jupiter. Devastated by her loss, Helena withdrew into herself resigning from the WSC. When she finally returned to the Commission, she launched herself into her work. Before long, her research brought her to the recently completed Moonbase Alpha where she guided the construction of tension-relieving recreational environments. 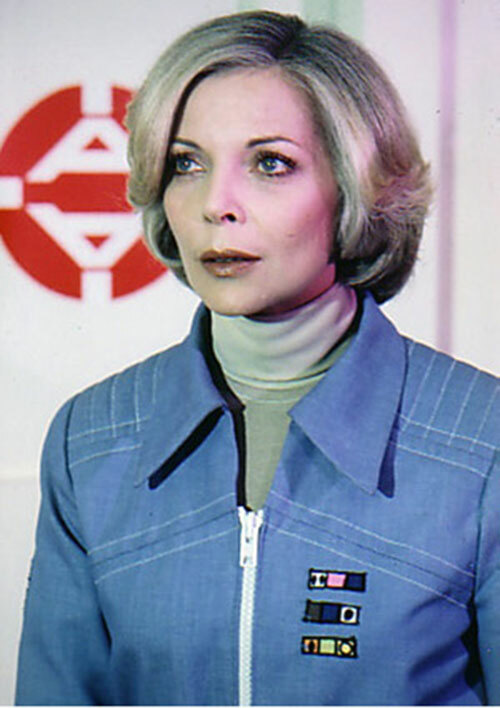 On January 3, 1999, Dr. Helena Russell was made Chief Medical Officer of Moonbase Alpha. In August of that same year, astronauts training for the planned mission to the wandering planet Meta started dying of a mysterious malady. Dr. Russell diagnosed this strange epidemic as radiation sickness although she could not account for all the symptoms displayed or where and when the astronauts had been exposed. Eventually the cause of this weird illness was uncovered. All the Meta Probe astronauts had been exposed to a buildup of quasi-magnetic energy while on their training flights. This revelation came too late, however, as, on September 13, the energy buildup reached critical mass. The subsequent explosion hurled Luna out of Earth’s orbit sending Moonbase Alpha and its inhabitants on their grand adventure. Dr. Russell’s mentor at college was named Dr. Robert Shaw. Her usual assistant in the Moonbase’s Medical Center is Dr. Robert Brian Mathias although she is sometimes assisted by Dr. Ben Vincent. Helena’s husband Lee (or something wearing his form) reappeared when the Alphans were investigating the planet Terra Nova. After granting Helena the power to undo the damage caused by the Alphan’s contact with Terra Nova, “Lee” disappeared again. Dr. Helena Russell is an attractive if severe looking Caucasian woman in her early 40’s. She has short, blond hair, large, wide-spaced eyes, and high cheekbones. Her Alphan duty uniform consists of khaki shoes and slacks. 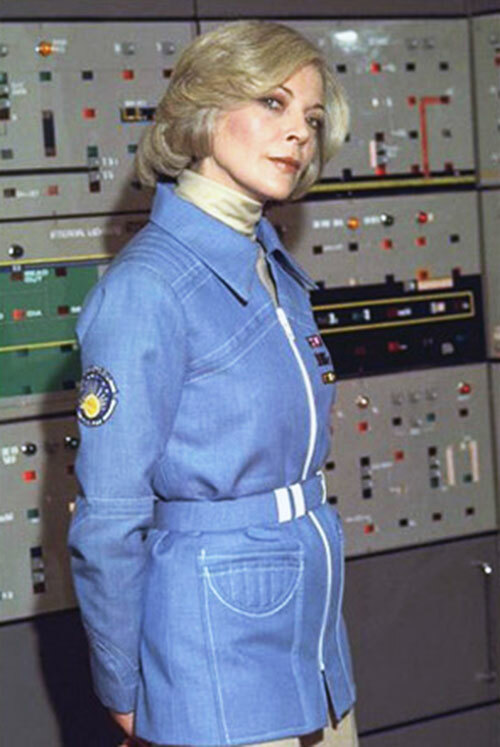 The khaki tunics of Moonbase personnel have colored left sleeves indicating the individual’s assignment on Alpha. Dr. Russell’s left sleeve is white signifying her assignment in the base’s medical center. Like all Alphans, she wears an I.D. badge over her left breast and a thick, khaki belt which her Commlock clips onto and which can support a Hypogun or Stun Gun holster. In later adventures, the Alphan duty uniforms for the Moonbase’s female contingent changed from the unisex design to a more flattering if less practical skirted and turtle-necked number. The colored coded left sleeve remained and the neck of the tunic was of a similar color. Dr. Russell often wears a navy blue jacket bearing Space Service insignias over this uniform. Dr. Russell may have been a visual inspiration for Dr. Chakwas in Mass Effect. Calm and rational, Dr. Helena Russell is a professional with a capital P. Early during her Moonbase Alpha assignment and for the first few months of Luna’s journey through the universe, Dr. Russell displayed the sort of detached caring that she felt was necessary for her to properly do her job. Over the course of time, however, she began to open up, sharing more of her true feelings with her colleagues and patients. Dr. Russell is quite close with Assistant Medical Officer Dr. Robert Brian Mathias and Professor Victor Bergman. She and Commander John Robert Koenig care deeply for one another though these feelings do not prevent the pair from taking up adversarial positions on occasion. Like her friend Professor Bergman, Dr. Russell always seeks out the scientific explanation of any phenomena and this rigid scientific approach to problem solving sometimes comes into conflict with Koenig’s more instinct driven style. 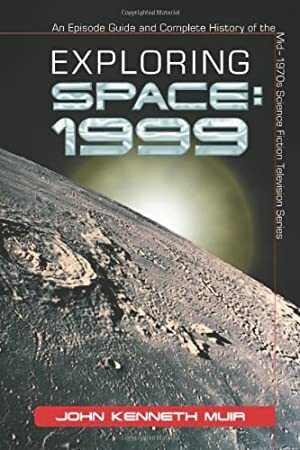 Obviously, for the events of September 13, 1999 to occur as depicted in Space: 1999, it is necessary to make wholesale changes in current DC continuity. A better tack, perhaps, is to use Moonbase Alpha and its inhabitants in an alternate reality story. The player characters, on their way to the JLA Watchtower, experience a teleporter tube malfunction and find themselves on a very different moonbase. If the PCs are low to mid powered heroes without the means to travel in space, a GM could have them materialize on Alpha just as Koenig and his staff are beginning to piece together what is occurring out in Nuclear Waste Disposal Areas One and Two. Since Alpha is home to many of Earth’s best and brightest, it might be interesting to station “Elseworlds” versions of established DC characters there for the PCs to interact with. For instance, Chief of Reconnaissance and top Eagle jockey Alan Carter might have a rival in Hal Jordan or Larry Trainor, Bruce Wayne or Lex Luthor might be ILFC board members visiting the troubled base, and Maya of Psychon could be M’aya, the last Martian. Dr. Russell’s maiden name, Gordon, presents several possible DCU links. A possible relative, scientist Bruce Gordon would be a natural addition to Moonbase Alpha’s scientific community. Perhaps Helena’s deceased father was the brother of prominent Gotham City Police Commissioner James Gordon. And Barbara Gordon might be training under Sandra Benes in the Moonbase’s Communications section. The story itself could revolve around the PCs growing certainty that something very bad and beyond their control is going to occur. Alternately, the players could arrive on Alpha post-breakaway. A sufficiently large PC group could tax Alpha’s already scarce resources to the limit. PCs who regularly risk death at the hands of murderous villains might not be so brave in the face of slow starvation. Or, for a more slam bang adventure, have the players arrive just as the insanely powerful Balor awakens. Brrrr. Scholar (Space Medicine), Security Clearance (High). Hypogun [BODY 04, Poison Touch: 08, R#2. The Hypogun is a small, hand held tranquilizer. The Hypogun’s Poison Touch Power represents a powerful, fast-acting sedative]. Commlock [BODY 03, Detect (Radiation): 08, Radio Communications: 06, Thermal Vision: 05, R#: 03, Bonus: The Commlock’s Radio Communications Power encompasses both video and audio ; the Commlock’s Radio Communications Power can be used to access Moonbase Alpha Main Mission Computer ; the Commlock then functions as a remote terminal of Computer. Note: The Commlock is a stubby, scepter-like device a little over 7 inches high. In addition to its communication functions, it has a number of other features. It is also a passkey of sorts. Each Commlock is programmed for an individual owner, allowing that owner access to those areas of Alpha appropriate to his/her rank, position, and security clearance. The Commlocks possessed by the Command and Security Staffs grant their owner’s unlimited access to all areas of Moonbase Alpha. Only Commander Koenig or Chief of Security Verdeschi have the authority to expand or limit a Commlock’s passkey function. It is also a Geiger counter, a clock, and a calculator and can measure temperature and atmospheric pressure]. LIFE SCAN BRACELET [Body: 02, Detect (Life Signs): 02, Radio Communications: 06. Limitation: Detect (Life Signs) can only measure the life signs of the wearer. Note: Each Alphan wears one of these watch-like devices which continually transmits information to the base’s Medical Center regarding its owner’s health (heart rate, respiration, brain activity, etc.). When in use by survey teams, this vital information is transmitted to the team’s Eagle Transporter and then relayed by the Eagle’s much more powerful Interstellar Transmitter back to Alpha]. One of the problems that Dr. Russell and her Alphan companions confront on a daily basis is how to allocate the Moonbase’s very limited resources. While mining and excavation of the moon produces some of the materials that the Alphans require, making a Wealth Check or finding components to build a Gadget on Alpha is never as easy as simply making a dice roll. As Chief Medical Officer on Moonbase Alpha, Dr. Russell’s resource needs are usually given a fairly high priority when allocations must be made. But the well is far from inexhaustible and the GM should feel free to assess CS penalties to Wealth Checks or even simply disallow them if appropriate. On the other hand, an effort to restock the base’s scarce medical supplies and find suitable substitutes for materials not easily found or made might present a dramatic change of pace from the usual battles against monsters, aliens, or super-villains. I have used DC Heroes 3rd Edition rules to model this character. No doubt, the Blood of Heroes or Sidekick Sleep Power would more accurately depict Dr. Russell’s Hypogun. Benefit 1 (Security Clearance), Equipment 8. Sense of Responsibility Dr. Russell feels responsible to the residents and mission of Moonbase Alpha. Trade-off areas Attack/Effect PL 6, Dodge/Toughness PL 3, Parry/Toughness PL 2, Fort/Will PL 3. Points total 49. Abilities 16, Defences 7, Skills 17, Powers 0, Devices 0, Advantages 9. Equiv. PL 4. Source of Character: Space:1999 Television Program.